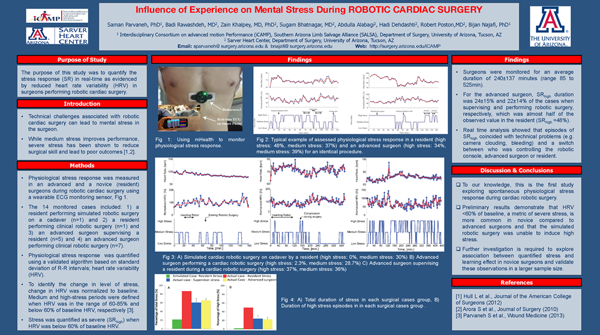 OBJECTIVE: Technical challenges associated with robotic cardiac surgery can lead to mental stress in the surgeon. 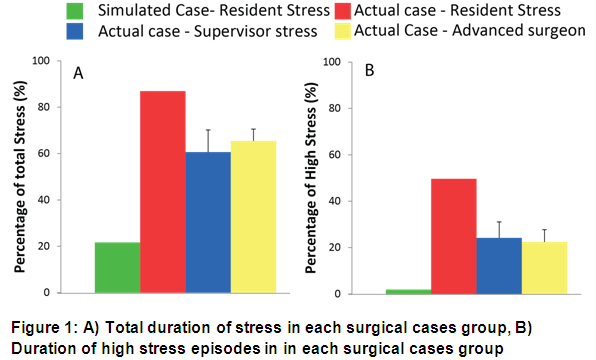 While moderate stress improves performance, severe stress has been shown to reduce surgical skill and lead to poor outcomes. 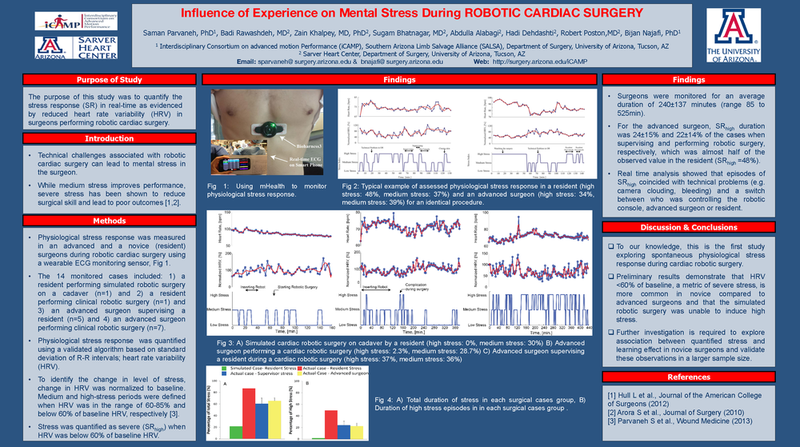 The purpose of this study was to quantify the stress response (SR) in real-time as evidenced by reduced heart rate variability (HRV) in surgeons performing robotic cardiac surgery. METHODS: HRV was continuously monitored in an advanced and novice surgeon during robotic cardiac surgery using a wearable ECG monitoring sensor to measure the standard deviation of R-R intervals based on ECG signals. The 14 monitored cases included: 1) novice performing simulated robotic surgery on a cadaver (n=1) and 2) performing clinical robotic surgery (n=1) and 3) an advanced surgeon supervising a novice (n=5) and 4) performing clinical robotic surgery (n=7). Stress was quantified as severe (SRhigh) when HRV was below 60% of baseline HRV. RESULTS: Surgeons were monitored for an average duration of 240±137 minutes (range 85 to 525min).Figure 1 illustrates the SR for each of the 4 categories of cases. For the advanced surgeon, SRhigh duration was 24±15% and 22±14% of the case when supervising and performing robotic surgery, respectively, which was significantly less than SRhigh for the resident at 51%. Real time analysis showed that episodes of SRhigh coincided with technical problems (e.g. camera clouding, bleeding) and when there was a switch between which surgeon was controlling the robotic console.